The little food-cart stop in Burlington's Old North End provides the essentials: pizza, tacos and creemees. You can eat one of each and spend less than $12. The friendly gathering also offers music — the Heptones played over the PA recently — as well as impromptu dancing. Momo's Market on North Willard Street is site of the two-cart setup that takes place on Mondays and Fridays if the weather cooperates. 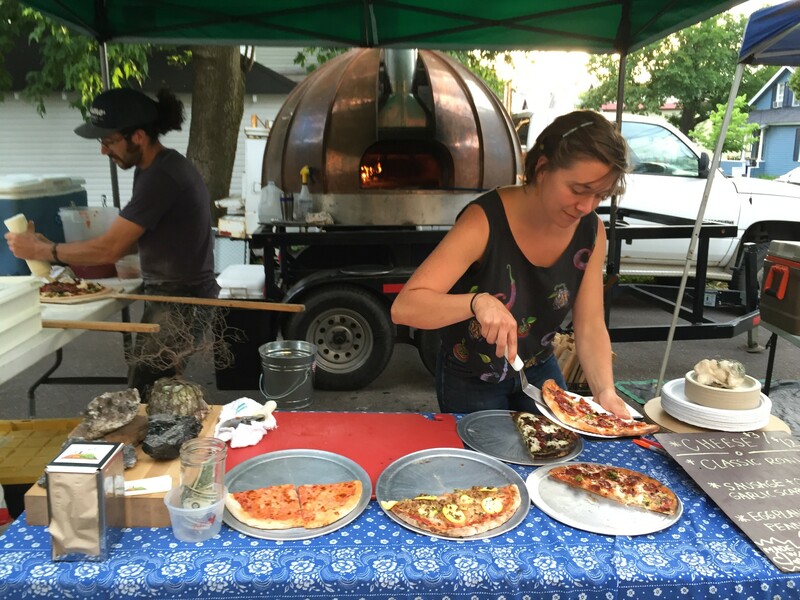 The vendors are ONE Hearth, a mobile wood-fired pizza oven topped by a copper roof, and Fuego, a traveling taco stand. Both use locally sourced ingredients, including organic produce from nearby Intervale farms. "This is great," local Bess Levison said, munching on pizza. "You can talk to the neighbors, talk to the vendors, and bring your father from out of town." Erin Malone, owner of Momo's, said she welcomes the food carts to the driveway behind her corner store. 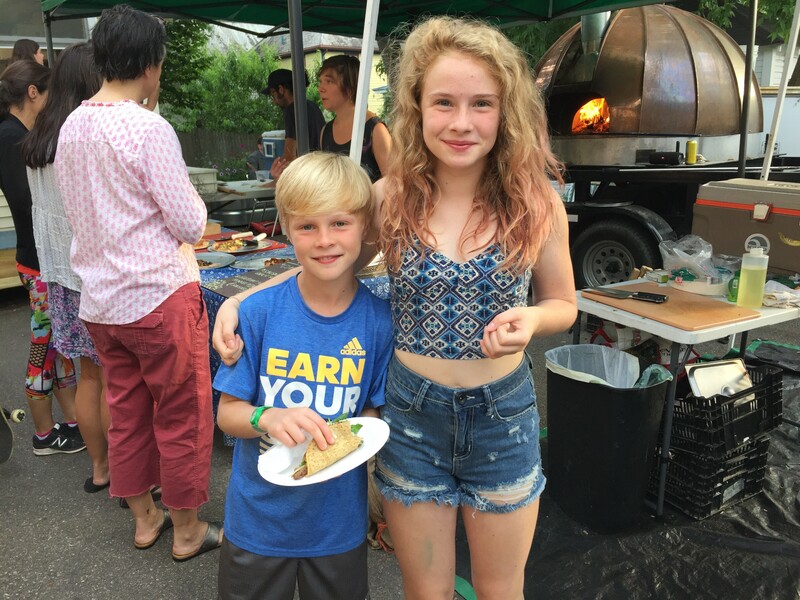 She got to know the vendors — Tucker Levy of ONE Hearth and Drew Thomas of Fuego — as customers at Momo's. The appeal of running a neighborhood store, Malone said, is precisely that: getting to know people and helping to facilitate community. "It's a place in the neighborhood for people to get good food," Malone said. "And these guys are entrepreneurs. It's good for them." Levy grew up in Middlebury and graduated from Middlebury College. He's a roofer (he made the pizza oven's copper dome) and runs ONE Hearth with his business partner, Colin Pratt. Levy joked that he took a "different path" than most Middlebury grads. His recent vegetarian special, $4 a slice, was heavenly — crusty pie topped with eggplant, beets, pesto, fennel and chevre. Thomas, originally from North Carolina, moved to Vermont to farm. He's a part-time breakfast chef at Willard Street Inn who operates his taco cart "here and there," he said, "floating around the neighborhood." "This is essentially what I wanted to do in the community," Thomas said. "Selling food to people who live around here, being on the street." His customers on a recent night included two farmers from Diggers Mirth Collective, and Mac Spencer, 9, who lives next door to Momo's. Mac gave the $5 steak taco with grilled shredded potatoes and greens a super-strong endorsement. "I do feel great," Mac said. "It's kind of lucky: You get to walk around the corner and this is dinner. It's cool." Malone said she'd love to have more food vendors set up shop in her driveway. Check in here for weekly updates on where to find food trucks, trailers and carts throughout northern and central Vermont.